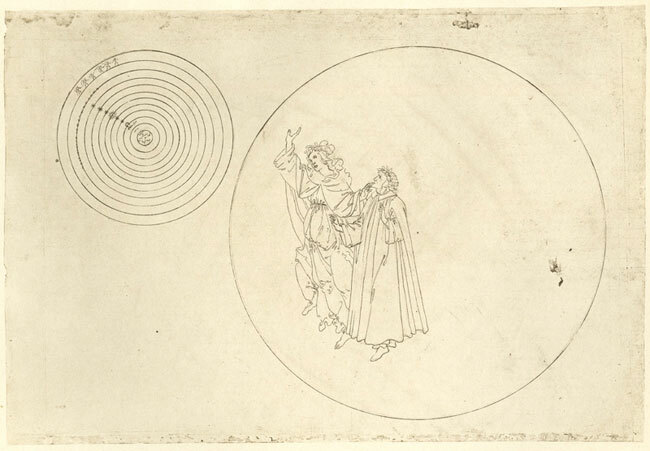 Look at the drawings which Sandro Botticelli made to illustrate Dante Alighieri’s The Divine Comedy. Dante’s journey through the three realms of the afterlife is depicted visually with breath-taking vitality and ingenuity. 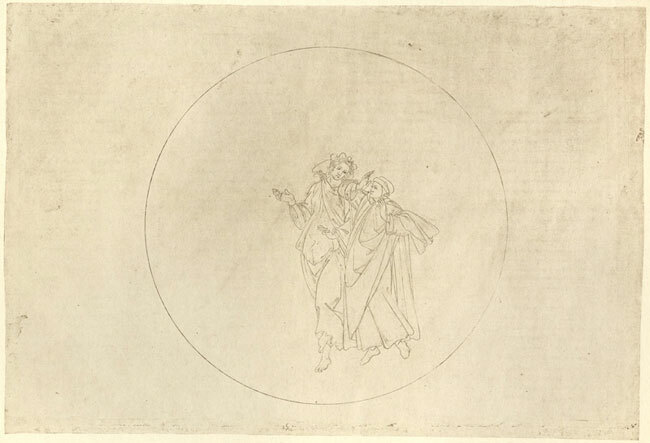 Sandro Botticelli, made 92 illustrations c.1480-c.1495 to accompany the text of Dante Alighieri’s “Divine Comedy” (1308 – 20). 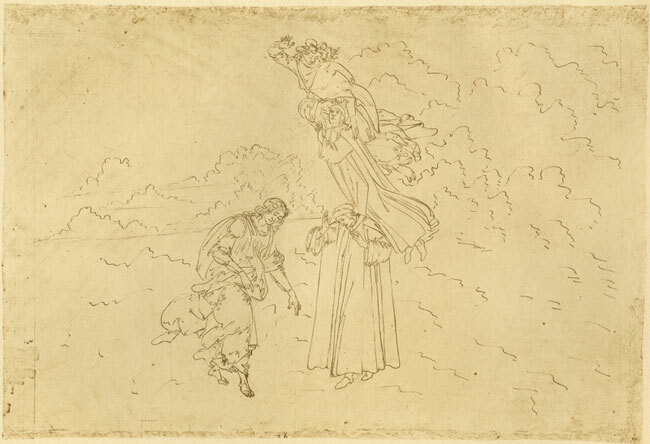 These writings by Dante had been illustrated previously by other artists but Botticelli took the illustrations to another level with both the nature of the drawings and sheer quantity of them. 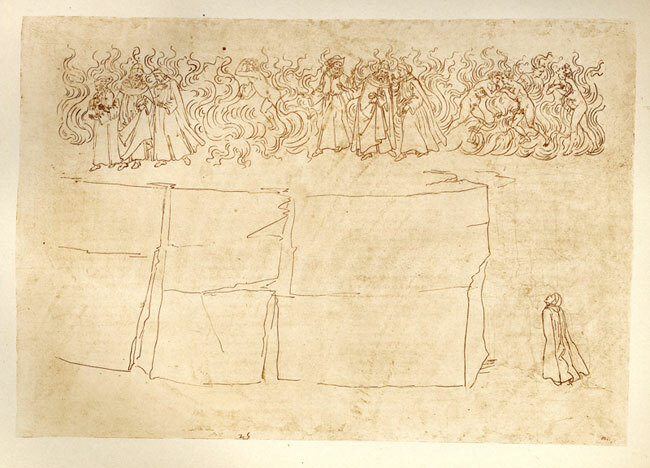 Others had isolated elements to illustrate where Botticelli illustrated all the sections of Dante discourse. 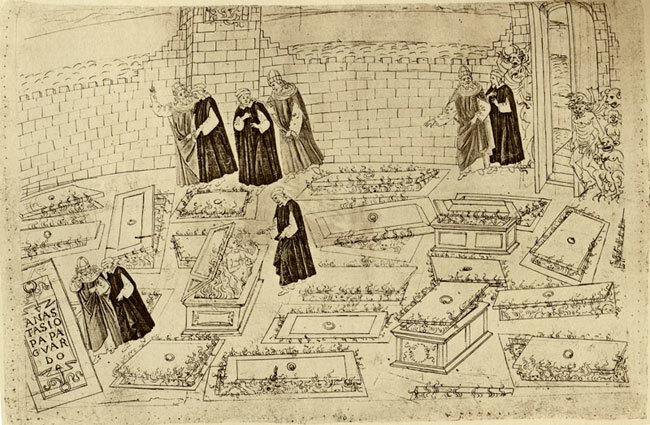 The original manuscript had been commissioned by Lorenzo di Pierfrancesco de’ Medici. Botticelli’s illustrations are a timeline of the journey by Dante’s journey through Hell, Purgatory, and Paradise (Heaven). In effect they are the first form of sequential art to be published. The text is in the form of a poem and is in essence an allegory for the soul’s journey towards God. The manuscript and the drawings fall into three sections within the manuscript and I reproduced examples from each section below (Figs 1 -9). 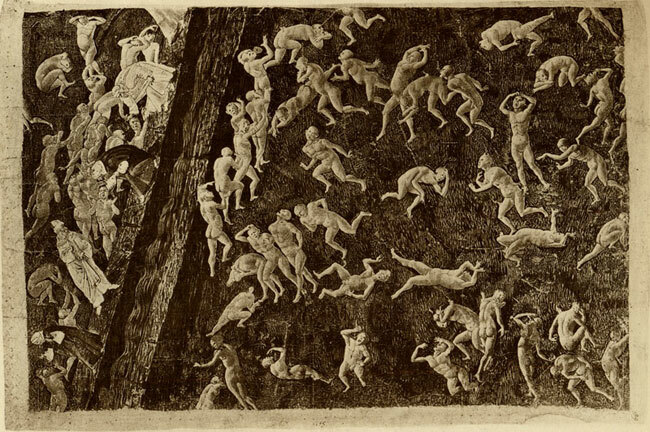 The first section, the illustrations of Hell (Inferno) are characterised by teeming images with tumbling bodies and the horror of hell. Perspective is abandoned as we see figures spinning with no gravity in evidence as well as the size of objects and people being the same despite them being in different planes of the drawing. There is plenty of detail in these drawings in this the first of the three sections. Both Dante and the viewer are bewildered by the avalanche of horror that Botticelli shows what is in store for us if we end up in the warm dark place of hell. In these images Botticelli covers the drawing in tone creating a dark heavy foreboding atmosphere, though this is curtailed in the last image I have shown from Inferno. The detail has been curtailed and a sketchier feeling is now in these the second section drawings. These lack the heavy tonal rendering of the first section. The perspective is more normal is depiction. Here, in Purgatory we are starting to progress to better places though all is still not right as the sinners of various types are punished for their transgressions. Here we see the scale and the extent he envisages of Purgatory in the drawings, he depicts the mass of sinners atoning. It should also be noted that modern standards the sins are not those so readily identified as such today. Gluttony and lust seem to be hailed as the pinnacle to aim for judging by the advertising and popular culture in evidence in society. The drawing has progressed over the three sections from being fully rendered dark tonal drawings to these ethereal sketchy drawings. This obviously suits the nature of the text but there may be a more mundane explanation for these change in style and substance to the drawings. It may have been that Botticelli evolved as an artist and what we see in the first section is his early style and later the sketchier feel and depiction of the subject is his mature style. 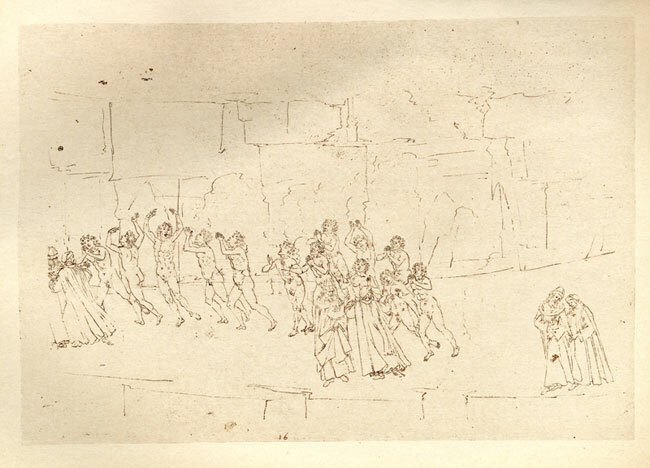 It is generally believed that he tackled the drawings relatively in order of the manuscript. Another, addition explanation is that he may not have completed the latter drawings as it was quite a monumental undertaking and his patron de’ Medici has passed away by the end of the project. It may in effect be an incomplete project. This is also the reason why only four drawings are in full colour, he may not have finished the colouring process on the others. He also did not ink the silverpoint drawing in some of the works. 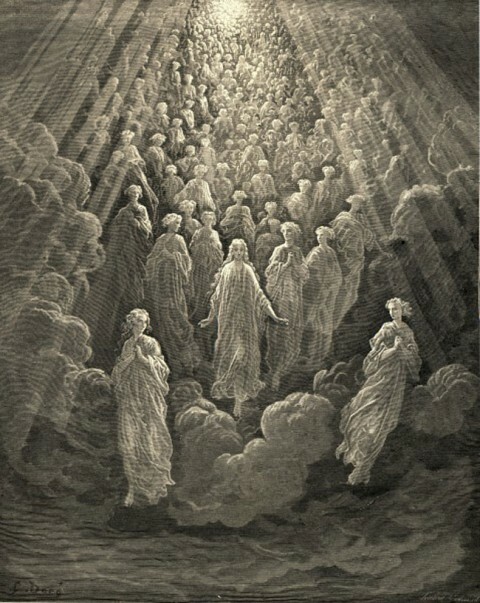 Another artist to illustrate the Divine Comedy, and whose drawings are more to my taste is Gustave Dore. 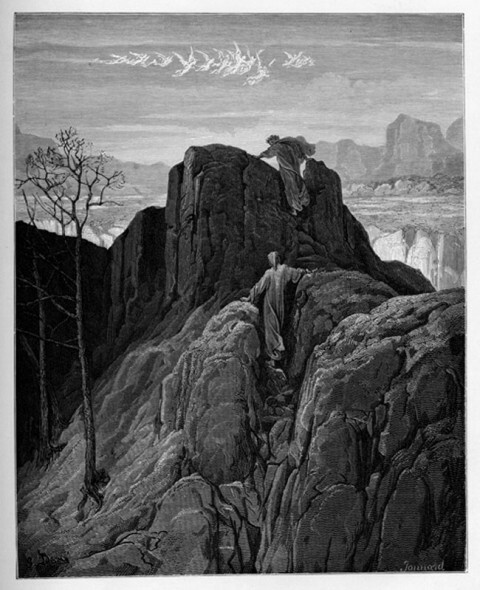 In 1861 when only 29 years old Dore already considerable reputation was further enhanced when he self-published his illustrations of Dante Divine Comedy. 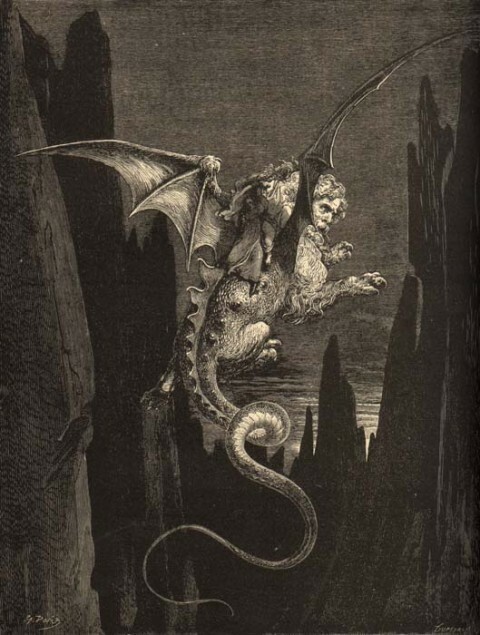 These illustrations are engravings and they amply illustrate the skill and vision of Dore. (Open Culture. 2018). His drawings are a darker more sinister version to most that have gone before or since. 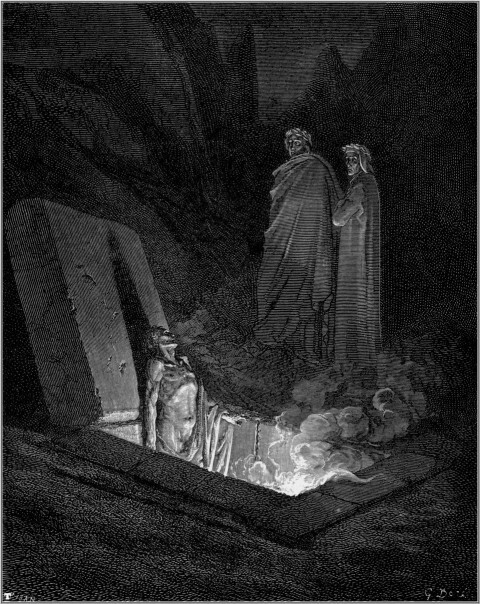 Dore also gained fame for his illustrations of the Bible and the dark writings of Edgar Allan Poe’s “The Raven”. The ephemeral line drawings by Botticelli turn to dark foreboding stark landscapes populated by monster, demons and craggy rocks by Gustave Dore with his fully rendered tonal engravings. Where the subject matter is dark Dore does not miss an opportunity to enhance the atmosphere with his dark and foreboding illustrations. Brain Pickings. (2018). Gustave Doré’s Hauntingly Beautiful 1883 Illustrations for Edgar Allan Poe’s “The Raven”. [online] Available at: https://www.brainpickings.org/2015/08/05/gustav-dore-poe-the-raven/ [Accessed 4 Jun. 2018]. En.wikipedia.org. (2018). Divine Comedy Illustrated by Botticelli. [online] Available at: https://en.wikipedia.org/wiki/Divine_Comedy_Illustrated_by_Botticelli [Accessed 5 May 2018]. Open Culture. (2018). Gustave Doré’s Dramatic Illustrations of Dante’s Divine Comedy. 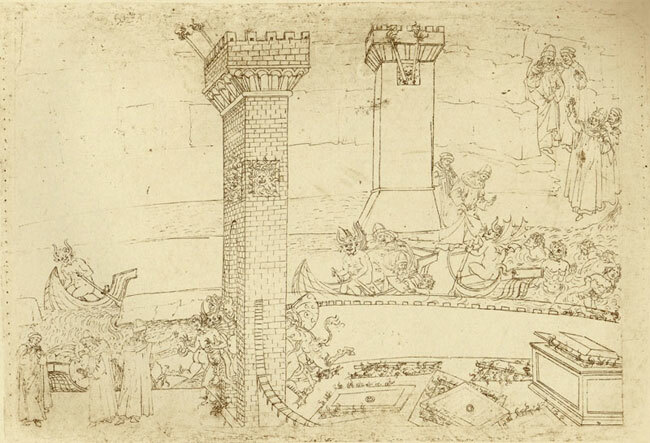 [online] Available at: http://www.openculture.com/2013/10/gustave-dores-dramatic-illustrations-of-dantes-divine-comedy.html [Accessed 5 May 2018]. Worldofdante.org. (2018). The World of Dante. 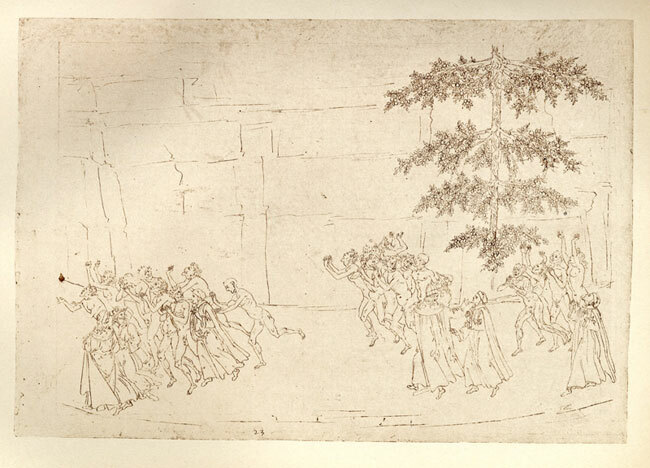 [online] Available at: http://www.worldofdante.org/gallery_botticelli.html [Accessed 5th May. 2018].